Editors: Soon, Jan Mei, Manning, Louise and Wallace, Carol A.
Foodborne Diseases: Case Studies of Outbreaks in the Agri-Food Industries defines the context of foodborne disease across a range of food sectors. 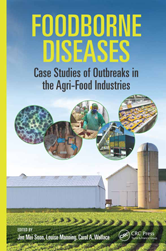 It provides insight into the causes and management of outbreaks along with practical lessons about foodborne disease prevention strategies relevant to stakeholders throughout the food supply chain. 2.3 Incidence of Web Search Queries in Specific FBD Incidents in Malaysia … . 4.3.4 What Supply Chain Standards Were Applied at the Time of the Outbreak? 8.2 What Made Outbreak Investigations Difficult? 8.2.4 What Is Quargel Cheese? 15.6.2 What Are the Implications for African Infants? 15.6.4 For How Long Had Adulteration Been Going On? 15.6.6 Is There an End to Melamine Contamination in Sight? 15.6.7 Could the Melamine Scandal Have Been Prevented?